Colloids are mixtures whose particles are larger than the size of a molecule but smaller than particles that can be seen with the naked eye. Colloids are one of three major types of mixtures, the other two being solutions and suspensions. The three kinds of mixtures are distinguished by the size of the particles that make them up. The particles in a solution are about the size of molecules, approximately 1 nanometer (1 billionth of a meter) in diameter. Those that make up suspensions are larger than 1,000 nanometers. Finally, colloidal particles range in size between 1 and 1,000 nanometers. Colloids are also called colloidal dispersions because the particles of which they are made are dispersed, or spread out, through the mixture. Colloids are common in everyday life. Some examples include whipped cream, mayonnaise, milk, butter, gelatin, jelly, muddy water, plaster, colored glass, and paper. Every colloid consists of two parts: colloidal particles and the dispersing medium. The dispersing medium is the substance in which the colloidal particles are distributed. In muddy water, for example, the colloidal particles are tiny grains of sand, silt, and clay. The dispersing medium is the water in which these particles are suspended. Colloids can be made from almost any combination of gas, liquid, and solid. The particles of which the colloid is made are called the dispersed material. Any colloid consisting of a solid dispersed in a gas is called a smoke. A liquid dispersed in a gas is referred to as a fog. Each type of mixture has special properties by which it can be identified. For example, a suspension always settles out after a certain period of time. That is, the particles that make up the suspension separate from the medium in which they are suspended and fall to the bottom of a container. In contrast, colloidal particles typically do not settle out. Like the particles in a solution, they remain in suspension within the medium that contains them. Colloids also exhibit Brownian movement. Brownian movement is the random zigzag motion of particles that can be seen under a microscope. The motion is caused by the collision of molecules with colloid particles in the dispersing medium. In addition, colloids display the Tyndall effect. When a strong light is shone through a colloidal dispersion, the light beam becomes visible, like a column of light. A common example of this effect can be seen when a spotlight is turned on during a foggy night. You can see the spotlight beam because of the fuzzy trace it makes in the fog (a colloid). What are some more examples of colloids. Also do you know any examples of Suspensions, Solutions, and mixtures? i hope that you have all the information about chemistry so that i will have my answer.. This is a very helpful site that really let me know even more about colloids! Thank you for posting this. It really helped me... i mean like, a lot. why do most colloids have electrical charges? why are colloids good adsorbents? THANK YOU VERY MUCH this is so nice and very conceptual i thank everybody those who help to know this information and WOULD YOU GIVE ANY MORE INFORMATION ABOUT COLLOIDS? what is the another properties of colloids?? and adsorption.....that is the properties of colloids..
but,what is the meaning of that? and thank you for the information!!!! This research was good. My nightmare about colloids is gone. Thanks this information. I could use this for some homework. Thanks again. Expecting more valuable information like this. more information please...thnks though.it helped me alot..
Do you have other examples of colloids and what is aerosol ? Exceptional! Thank you very much. The information was clear and easy to understand. Keep doing what you're doing!! what is the differentiate between suspensions and colloids? what are the importance of properties of colloids in technology, medicine, and households? .i get all information i want ! thanks ..
.i really appreciate the maker of this article ..
.i hope you made a lot of articles ..
why is that the color of the sky is blue while the clouds is white? your website is very useful.. I LEARN LOT ABOUT COLLIODS.MMP THANKS SA INFO NYO, IT HELP A LOTIN OUR GROUP REPORT IN CHEMISTRY. THE ARTICLE IS NICE BUT NEXT TIME, CAN YOU ADD MORE IMAGES WHEN REGARDS TO TYPES OF COLLOIDS? I WOULD REALLY APPRECIATE IF YOU WOULD CONSIDER MY SUGGESTION. This was very informative and yet easy to read and understand! It is amazing that the science is so specific! I wish more people were interested in science! It is pretty cool!! I love this page so much. I know the relevance of colloid. I like this page as it is the most simplified one and is very accessible to use it when in time of need. I look forward in future to receive such help. how we consider that the paper is an ex. of colloids? This article is so informative! and STRAIGHT to the point. Everything written here is so UNDERSTANDABLE! It is helpful to me to search about the liquid colloids to answer my task/home work in my school. Thank you so much! it really helped with my paper!!! It gives more impormation...for my homework and projects..
We are comparing Oobleck (corn starch and water) with the properties of the asthenosphere. We know that Oobleck has properties of colloids, but does the asthenosphere have colloid properties? whats is difference between tyndall movement and brownian motion ? I realy like this site. All my science researches are done here, as i prepare for my final exams(WASSCE). Is this what a facebook is? Im not quite sure what I am doing but i know this is a post. Excellent! Helped me a lot to finally understand colloids. I learn more about it. thanks a lot. i love to know more about it. Why is it not possible to have a gas in gas type of colloid? Solution is mixture of 2 or more substances in equal proportion such as sugar or salt in water.But to differentiate colloid and suspension solution,there is big diff. 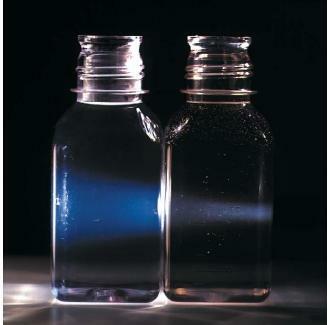 that in colloidal solution,size of colloidal particle is in between 1 to 1000 nm and they show scattering of light(even though they r not visible with naked eye) and for suspension solution,suspended particles r in range of size of more than 1000 nm.These particles can be seen through naked eyes. this is a great answer i love science thanks a lot! TNX FOR THIS IT HELPS ME VERY MUCH IN MY LESSON. why do we need to introduce your own answer if we dont know your questions about the 5 senses of colloids? Very nice. i really love the way it was explained! this website is so unique and so cool.. the information are complete..
state between a true solution and a suspension example plz . it was very interesting and very specific and to the point. i liked its way of giving perfect answers and explanations about colloids. thank you very much. What are the types of colloids which are present in smoke, dust, milk etc. Is human sweat a colloid or a solution? I need to know for homework but can't find the answer anywhere. thanks for the definition!! it really helped me in my holiday homework.